Corn Basil Salad That Has Only Four, Simple Ingredients! 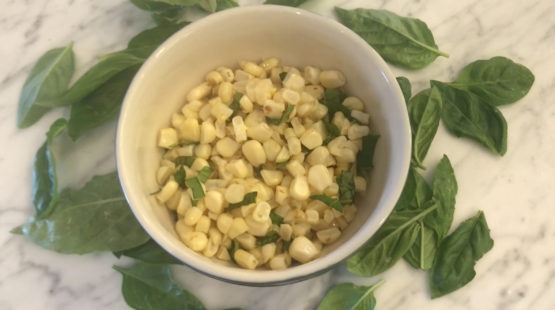 A simple, anytime Corn Basil Salad that anyone can make. There is only one key to this recipe and you can do it! A simple Corn Basil Salad may not sound like much. But, I promise, it will wow your guests. There are only four ingredients to this recipe, but somehow it comes out amazing! The key is to have FRESH ingredients and- this is the trick to the whole thing- DO NOT OVER COOK. Let me explain. Shuck and shave all four ears of raw corn. Wash basil and let dry. Spoon tablespoon of Earth Balance into hot, LARGE frying pan. Add in corn – and here is the trick! – for 30 seconds. Then turn for 30 seconds. Then IMMEDIATELY take off heat and put into bowl. Salt and add in basil. Serve to people who can’t believe it is so simple and so tasty!